Recent research proves that horses are able to discern between different people, and cannot just positively identify a familiar person from a stranger, but can also distinguish between several familiar people. As a prey animal, and one naturally inclined to be in amongst a herd, horses evolved to communicate via body language (often incredibly subtle) and, to a lesser extent, vocalisation. As the horse became domesticated by man, increasing interaction with another species became necessary; in fact, most horses in today’s society are far more likely to interact with humans on a regular basis than equine herd mates. As such, one would expect that there remained a need for horses to be able to distinguish one individual from another – only now this need would be to differentiate between humans rather than horses. Interestingly, what most horse owners have maintained all along has now been verified - recent research proves that horses are able to discern between different people, and cannot just positively identify a familiar person from a stranger, but can also distinguish between several familiar people. 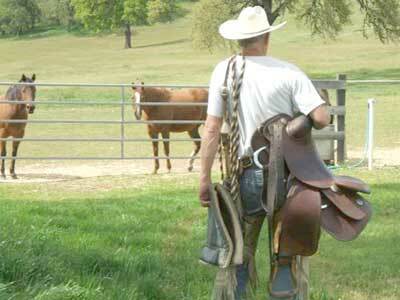 Previous studies have demonstrated that horses possess the capability to recognise a familiar horse. A study by Proops et al., (2008) had horses observe a herd mate being led past them and out of view, after which a call from that horse, or a call from a different herd mate, was played from a loudspeaker situated near to the place where the led horse had disappeared from view. The researchers found that when horses observed one herd member but then heard the call of a different herd member played through the speaker, they responded more swiftly, and looked for a significantly longer length of time in the direction of the call, than when the call played through the speaker was that of the actual herd mate just observed. 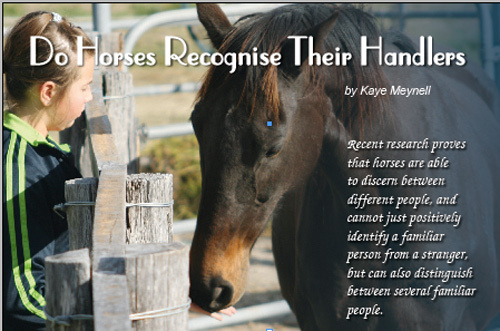 The research is interesting in that this recognition of a herd mate, based on both visual and audio information, points to horses being able to store and access memories relating to the characteristics of certain other (familiar) horses. In the wild, being able to recognise familiar horses is necessary for survival - horses are reliant on a herd environment for their safety – though it appears that close relationships are forged between particular horses within the herd that suggests motives serving above and beyond those purely required for survival (Goodwin, 2002).